Does this look like the kind of dude you’d want to mess with? No, no it doesn’t. See that face? You wouldn’t hit on his huge scaly girlfriend, that’s for darn sure. The Rathalos is a species from Capcom’s much ballyhooed Monster Hunter series. For the uninitiated, these titles are arena combat/action RPG affairs, pitting you and up to three other hunters against the titular monsters. You join a quest to slay or capture a specific beast, take up your sword/lance/huge ridiculous Thor-esque hammer and attempt to murderize your quarry right in the face. Therein lies the rub, though. The monster itself has mixed feelings about the whole situation, and won’t hesitate to crush you into a puny heap of blood and mangled defeat on the ground once you get it riled. There’s more to it than simple good ol’ fashioned hack and slash violence, too: you’ll often have to track and pursue your opponent between zones (which is to say, arenas) on the map. Anywho, yes. 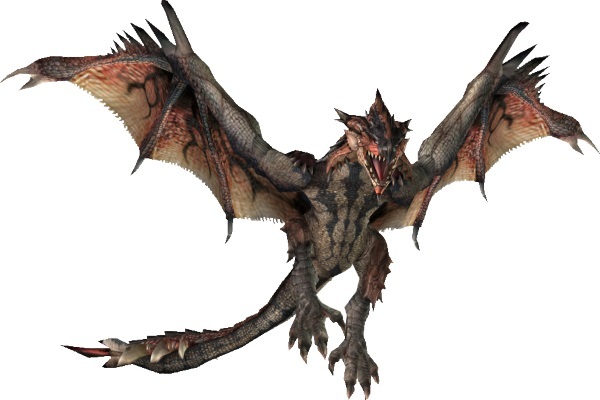 One particularly irritating culprit of this whole stop-flying-about-and-stand-still-so-I-can-wang-you-in-the-eye-with-my-sweet-sweet-stabby-lance is the Rathalos itself. Hold on to your underpants, here it comes now. When you begin the game, you’ll dread their impromptu appearances. But after a few hours of gaining experience and equipment, you’ll be able to effortlessly swat them aside, like flies. Huge, furious, fang-y flies. How the tables turn. During their oh crap, it’s Rathalos… run for your feeble squishy lives period, though, these things are all kinds of menacing. They’re adept at aerial attacks, diving at your face with their poisoned claws or blasting fireballs from a distance impervious to most weapons. They also have an uncanny knack for doing the latter right as you’re healing, destroying your hopes, dreams and life in one fell swoop. 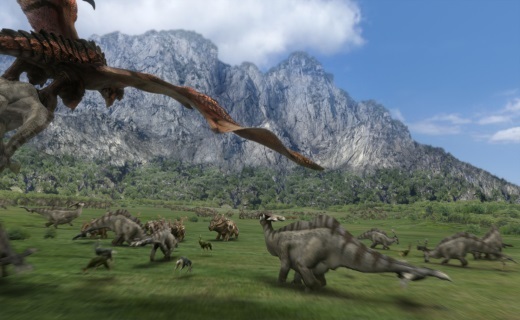 Rathalos, more so than Rathian, spends much of its fighting time in the air, which can be a real pain if you have no manner of knocking it down. Nevertheless, they’re pretty darn ungainly in combat on the ground, and are very vulnerable to staggering and part-breaking. For my part, this was the first intimidating ‘boss’ I faced in Monster Hunter, and it has a special place in my wyvern-loving heart for that.